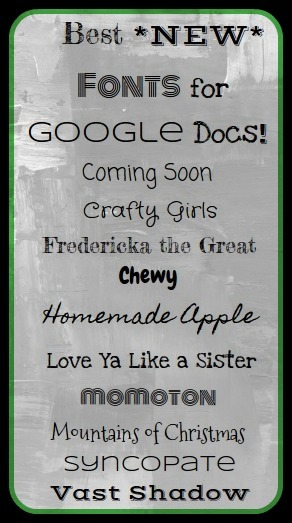 If you aren't using Google Drive yet, you should be! While it isn't perfect (yet) the mobility and ability to share seamlessly make it my go to document editor. Adding these 10 fonts to the basic preinstalled fonts will help you develop attractive and creative documents quickly. Currently you cannot add new fonts to Google Spreadsheets (or Google Sheets, or whatever they are calling it this week). I'm sure that will change in the near future and it will work similarly. It's actually a typo and it's called Monoton. I was looking for it and found it so it's still on there. Using my android doc app that option isnt there. I have maybe 10 to choose from. You need to follow the instructions to add new fonts to Google docs.